It really is a lot of fun to decorate our homes for the holidays with handmade decor. I love all of the handmade Christmas ornaments, stockings, wall hangings, gifts, etc., but it is especially awesome to set the holiday table with a cross stitched table-runner in the center. A decorative table runner seems to brighten the whole room. Even when the china and table settings are put away, the table runner remains as a beautiful decoration for the dining room or kitchen. 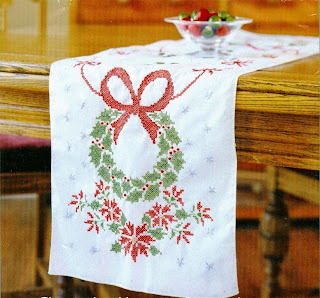 The Christmas Wreath Holiday Tidings Tablerunner kit offers you an easy way to make a great holiday table decoration. From the big red bow, to the holly leaves leaves and the poinsettia flowers blooms, this tablerunner is simply perfect for any home. The kit includes a pre-made table runner with finished merrowed edges. It has the cross stitch design stamped on it so you can cross stitch it without having to refer to a separate pattern. The DMC floss requirements are included, but the floss is not included in this kit. For some designs, I actually prefer that so I can select the shades of red and green that best compliment my own Christmas china. The finished table runner is 14" x 44" and is machine washable. The kit was made in the USA and is a Bucilla product, which we all recognize as a name we can trust when purchasing cross stitch kits.